Mink Says No Excuses, Amerks Injuries Healed · Let's Go Amerks! The excuses for the Amerks going 5-8-1 through the month of December ranges from the depleted lineup due to injuries and call ups, the travel, the fatigue, and the lack of practice. As of practice this morning there is not a single player on the Amerks list of injured players, everyone has been cleared to play. That includes Alexander Salak, Tyler Plante, Mike York, Mike Duco, Shawn Matthias, Rory Fitzpatrick, and Luke Beaverson. All of those things seem pretty obvious and actions will speak for themselves this weekend when the Amerks play three straight home games. The Amerks are 13-2-2 at home this season so the odds are in their favor. If there’s a place you want to be successful it’s at home. Practice looked like a training camp with more than enough players but it sounded like a mid season practice of a team not playing up to their potential. The team was on the ice for almost an hour and a half and by the sound of things it was the same length yesterday, not including long workouts prior. If a player did not complete a drill to the end Benoit Groulx stopped practice to point it out and share a few words. There’s no doubt that the defense more than anyone else was in need of some long tough practices to get back to the basics. They need to play more physical. They need to play smarter. They need to control the puck better. I’d say the practice was a positive thing. It’s easy to talk about the shortcomings of the team but at the same time they know what they need to do and worked on those things. Chris Taylor is typically one of the first players off the ice after a practice but on Tuesday he was one of the last. 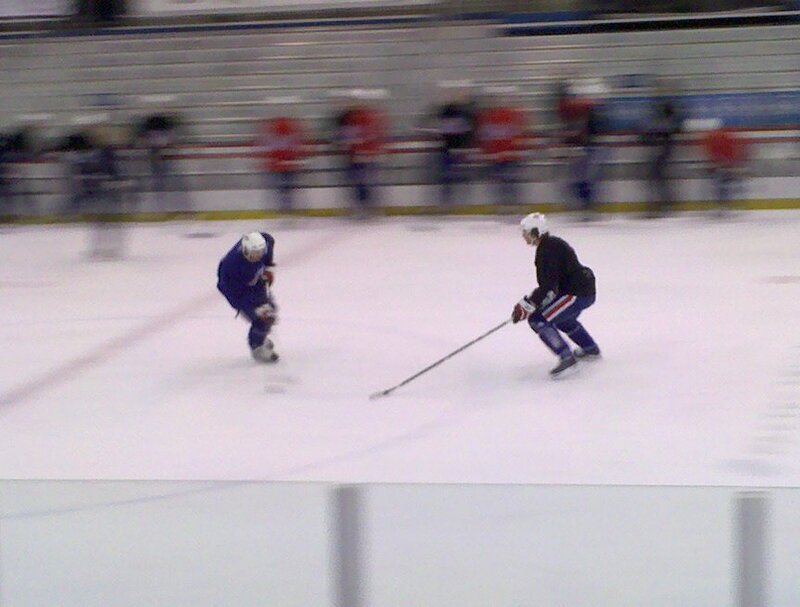 He was spending extra time one on one with Evgeny Dadonov at one end of the ice. * Alexander Salak and Tyler Plante were the two main goalies. If everything goes as planned I expect Salak to play on Friday and Sunday with Plante starting on Saturday afternoon. * Ryan Mior was not on the ice and sent back to the ECHL. * Steve MacIntyre was called up for Tuesday nights Panthers vs Maple Leafs game. * Daniel Steiner is still with team and will hopefully stick around. The guy is living the dream, I’m hoping to have a story on him finished tomorrow. * As mentioned above every player recently mentioned in my injury report were all on the ice in full contact practice. The list includes Alexander Salak (shoulder), Tyler Plante (knee), Mike York (personal), Mike Duco (foot), Shawn Matthias (knee), Rory Fitzpatrick (hernia), and Luke Beaverson (shoulder). The last thing I wrote down was the different offensive lines during practice. Chances are they could change prior to the next game but a lot of people ask. The team has the day off on Wednesday and will have another practice on Thursday prior to three games this weekend.